Planning to set off soon, just need to finish packing and load the car. Not sure how much web access I will have, but will update this with news when I can. If you have read much of this blog, you will be aware of some issues I have had with batteries going flat, and after checking the car, no possible reason for them doing so. One of the first things I checked after battery issues, and I have done this multiple times, was the boot light. When we put the latest new battery in, I checked the boot light (by folding down rear seat), and it was off. While cleaning the car on Sunday, I checked again – it was on. Boot light contact now unplugged…. Have also noticed that sometimes the boot open warning light comes on, a firm close fixes it, but it could be a dodgy switch. Shall check the car tonight for voltage. After a week of sitting before Sundays’s drive it had only gone down to 12.55 which is still very charged. Only 58 hours to go until we head off for the Ring. 80 hours until we can get on the track, where I will be driving very sensibly… Feeling most aware of the hazards associated with this trip. Took the Saab to a little Supra meet on Sunday, organised by Steve who is responsible for the Ring trip. The Saab needed a run since it had sat for a week. Drove fine, although all those poly bushes make bad road surfaces very noticable. After the meet, since I was in North Wocester and needed fuel, I headed to the Shell garage between Droitwich and Bromsgrove since it was close and I only use V-Power. Shell fuel is tricky to find. There was a convenient station in Worcester, but they closed that a few years back. There was one in Ledbury (expensive), but that became Texaco. This Shell station has become BP. Not happy. Anyway, hopefully I will be able to get Shell at Bracknall on my drive South on Wednesday night – if they haven’t turned it into another company. Are Shell closing stations because they are doing badly? On arriving home from my dissapointing fill I decided to give the car a bit of a pre-trip clean.Hoover, interior plastics, wiped the brake dust off the wheels. Car was clean due to being garaged, but a little dust from a small rain shower was present. I lightly wiped the bodywork and then cleaned the glass with Autoglym car glass cleaner. On doing this I noticed some fine scratched in the windscreen. I am now not sure as to whether these were there fom the wipers (seem to be in the right direction), or from the polishing when it wasn’t perfectly clean… it’s hard to tell. Noticed fine marks in the paint as well, but these could have always been there since it is 11 years old, and I am only becoming sesitive to them since I started looking for them. Either way, it’s all very minor, and for an 11yo car it’s in good condition. Still not using any engine oil (decent Saab engines), and can’t see any evidence on the garage floor of gearbox oil so that’s good. Have equipped car with 4 yellow Hi-vis vests, and added gaffa tape, spare silicone hose, Haynes manual and a small multitool to the collection of goodies in the spare wheel well. Lucky the Saab has a big boot, since we will have 2 holdalls, cool box (bring goodies back from France), 2 helmets (one in bulky bag), Disklok and other bits and pieces. The car has been in the garage since Friday, with regular checks on battery voltage. All seems good, it has settled down to a healthy 12.61 volts, which is what a fully charged battery should. The battery I removed, despite being fully charged by the charger and not on a car has dropped to 12.4 volts, so it is not as good. Some more discussion on disk and pad bedding in here. It does seem like I need to take a hard-work approach to the brakes, so I guess that is one for Sunday and the Supra meet I should be going to (I know the car isn’t a Supra…). I am contemplating a battery maintenance device to leave attached when my car is in the garage. I think I want somethign which will hold voltage at 13.2 volts or thereabouts, some seem to maintain 14.4v, which is ok for a top-up charge but seems to be too high to maintain in the long term. I plan to work through a few articles/FAQs on batteries and see what products best match the recommended advice. Phoned the garage at lunchtime, and they said the car was done. Got a lift over there and collected car. Which I guess the above does. So disks want a different approach to pads. Also took some pics of the engine with the new battery in. Saab is in the garage today, Motorlink in Malvern, same place that did the MOT. They are doing the disks and pads, and hopefully they will do a good job. Changed the battery yesterday, bought a Numax 60Ah battery for 65.80 from Autostores in Malvern who seem to be a decent parts supplier. Nwe battery seems to hold mroe charge than the old one – I gave it a top-up charge before fitting, and despite beign 12.6 volts owhen I bought it, which is higher than my old battery normally sat, it took a lot longer for the voltage to rise under charge, so I reckon that means more capacity. When I out it in the car in the evening it was on 13.0 volts. Current drain from the systems when shut down was 30mA, which is fine. In the morning the battery was at 12.83 volts. Seems good and charged to me. That all sems good as well. I have some time vs. voltage measurements for recharging the old battery which I will post here later, as well as some photos of the new brake disks. Ready to have a crack at changing the brake pads and disks, my Supra-driving friend arrived at 19:00 and we went out to the garage. The car didn’t respond to the remote – I knew immediately that the battery was going to be completely flat. This has happened before – see July 2006 , August 2006, November 2006 and December 2006 for details. Car had then been fine until now. Lift bonnet, apply multi-meter. 0.05 volts. Remove the battery, and after 15 mins it is up to 2.0 volts. I gave up on the brakes. Had even bought a bench grinder at lunchtime, but that can go back. I am now depressed with the car. Since Friday I have bought new disks, new pads, need a new battery, potentially have issues with the charging system, and it needs to go to the garage so that is more Â£Â£Â£. It seems that the far edges of the ‘lugs’ at the ends of the pads have been ground/filed by a couple of mm. The circles in the below picture show the areas. Since the new DS2500s are going on soon, and I am foolishly contemplating doing the job myself, I decided I need to know more about what modifications might be needed to fit the pads into the 9000 callipers. I therefore dug out the pads I had on from 2004 – 2006 (including trackdays at Anglesey and Goodwood) to compare with my new pads. The old pads had a hard life, I don’t think I bedded them in properly, as well as warping the disks leading to judder when very hot. 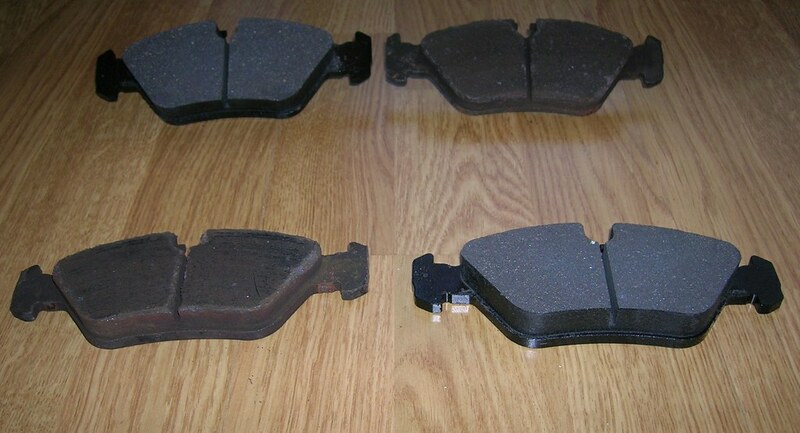 Anyway, I can’t see any places where the new pads are different to the old pads besides the levels of wear.